A.Millar: THE EDL HAS BECOME A FORCE TO BE RECKONED WITH……. – The Tundra Tabloids……. A short time later, the English Defense League [EDL] emerged from the United People of Luton, and, in a little over the year since its founding, has become the largest street protest movement in Britain. 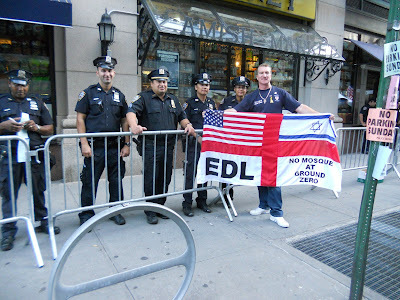 The EDL has also inspired the recent establishment of independent leagues in the Netherlands, Norway, Germany, and other EU states; the movement is attracting international attention – including from the Israeli-based Haaretz and the US-based Dissent. Wearing black T-shirts, emblazoned on the back with the English, Israeli, and US flags, the name of the movement, and the legend “No mosque at Ground Zero,” the EDL entourage attracted much attention from the press and passers-by, many curious to know the meaning of the T-shirts and the England/EDL flags the group were displaying – and where they could purchase them. People waited patiently to have their photographs taken in front of the EDL flags, flanked by its members. African-American women, Asian men and women, and the young and old all went up, and posed, smiling. Such positive attention must have been a welcome change for the EDL. To be photographed in front of one of its flags – or even an English flag, except during the soccer World Cup season – would be, politically and socially, considered unseemly in Britain: to wave an English flag now in England is enough to be stigmatized as a “racist.” One EDL member complained that his local council had sent representatives to his privately owned home to order him to remove an English flag he was displaying. Although he refused, there have been many cases of threats of arrest or prosecution for flying the flag of England. Previous Post Previous Post DEARBORN TRIAL OF CHRISTIANS ARRESTED FOR PROSELYTIZING ARABS ON PUBLIC STREET GETS UNDERWAY……. Next Post Next Post SKULLDUGGERY IN SWEDISH PARLIAMENT AS PM SEEKS TO REDUCE REPRESENTATIVE PARLIAMENTARY COMMITTEES…….